In the height of the Cold War, the NSA and CIA worked hard to undermine the USSR’s space program. They got a little boost from an unexpected place. At the height of the Cold War, the Soviet space program held a tantalizing secret. They were furtively communicating with their spacecraft and interplanetary probes through a hidden, deep-space radio channel. Like the various radio channels that make up NASA’s own Deep Space Network, the missing link provided two-way communications between Soviet mission control and Soviet spacecraft. While the Americans knew it existed, they didn't know where or how to find it. The RFI van was used to intercept some signals. The Americans threw everything they had at the problem. Spies were sent to study Soviet displays at international space expositions. Signal intelligence experts endlessly probed for the radio link from secret listening stations near Soviet mission control in North Africa and the Middle East. CIA analysis scoured for clues in everything from satellite images, to Soviet propaganda, to offhand comments made by the Soviet colleagues of western scientists. Yet for 21 years — from 1962 until a fateful night in 1983 — the mystery persisted. Only now, with the recent declassification of one NSA and two CIA reports, has the story emerged. Although the reports are heavily redacted, the story of this quest for the secret Soviet signal is nonetheless astonishing for two interconnected reasons. First, for the sheer depth of effort the Americans spent to uncover the radio signal. And second, for how inconsequential the signal, and the data it hid, actually was. It was in 1962 that the Americans first became aware that the Soviets were communicating with their spacecraft through a hidden signal. That year the Soviets launched their eighth interplanetary probe, Mars 1, which eventually failed like the seven probes before it. (Of the first seven Soviet probes bound for Mars and Venus, only Venus 1 ever even left earth orbit.) At 66 million miles out, the Mars 1 probe lost its antennae lock on Earth and was never heard from again. But before it twirled off into the endless darkness of night, “the Soviets announced that [the Mars 1 probe] would be communicating on four radio frequencies: [at] 163, 32, 8, and 5 centimeters,” recounts an undated NSA report. The first two radio signals, with frequencies of 163 and 32 centimeters were eventually found by signal collection experts to be simple satellite control and orientation signals—and were used by almost all the Soviet craft. American spy radio telescopes near the Soviet Union uncovered the third signal as well — the one at 8 centimeters — but it wasn't all that important. It was discovered to be a rarely used radio signal reserved for very specific scientific experiments involving “the passage of a celestial body between two others and the resulting observations,” reports the NSA document. Basically, it was used to measure eclipses. What remained uncovered was the fourth signal, with a radio frequency ostensibly at 5 centimeters. That is, unless the Soviet announcement had been deliberately misleading listening Americans. This was a possibility that never left the minds of the analysts, according to Burke's CIA report. Over the years, CIA analysts became increasingly confident in the purpose of this final, hidden signal: that it was used to send detailed scientific and imaging data from probes and other craft. Although the fact that this information was being hidden from the Americans annoyed them, the data itself wasn’t at all vital for American interests, or even that useful for American cosmologists and other space researchers. “Soviet planetary results have seldom been of primary importance to the United States and, when unique data are obtained, they are eventually published in the scientific literature,” admits Burke in the the first CIA report in 1978. Furthermore, Soviet imaging data kinda wasn't very good, at least compared to what the Americans were gathering with their own experiments. “Because of the relative low priority of orbital planetary imaging in the Soviet program, our own planetary mapping has been much better than theirs,” reports Burke. Still, the sheer irritation of an elusive, clandestine signal during the Cold War era — where secrecy and intrigue were currency of the highest value — was too much for the Americans to bear. The Soviets were hiding something, and the Americans wanted to find it, practicality of the data be damned. To lock on and listen in to someone else's deep-space radio signal, you basically have to know three things. First, where to look in the sky to find it. Second, when to listen in. And third, what radio frequency that signal is pinging back home with. The where issue was relatively easy to solve. “Soviet planetary spacecraft radiate a housekeeping telemetry signal... which can be routinely recorded using large antennas on Earth,” details Burke's second CIA report, written in 1984. “By tracking this signal soon after launch, we can learn the spacecraft's trajectory well enough to forecast its position in the sky during the months of transit to a planet.” Easy as pie. As for when to listen in, that was a bit trickier. First, there was the problem of geography. “Soviet mission control was located in the Crimea,” outlines the NSA document, the opposite side of the world as the United States. This misalignment was an issue because, “satellite transmissions were of short duration [and only happened] when the station in Crimea could 'see' the satellite,” But during these short intervals, the sky over the United States would be facing the opposite direction. In short, Soviet spacecraft pinged home behind North America’s back, so listening stations there couldn't hear. The solution was to use covert listening sites near the Soviet Union. According to the NSA document, “the best sites to listen in to the were located along the same meridian as the Crimean site,” such as two now-defunct sites in Turkey and what's now Eritrea, and a several other spy sites whose locations are still kept secret, and are redacted in the reports. (If we're speculating: a good guess is Israel, as it's right along the Crimean meridian.) Not a simple fix, but solvable. But it's the what issue, the exact radio frequency of the signal, that hampered listening efforts for 21 years. Although the Americans knew to generally look in and around the 5 cm band of the radio spectrum, “the usable radio spectrum is so enormous relative to the bandwidth of a typical planetary signal that a blind search, simply tuning across the dial as one might do with a car radio in a strange city, has essentially zero chance of success,” writes Burke in the second CIA report. The signal could have been at 5.034567 centimeters, or it could have been at 5.911142 centimeters. There were just too many choices. If the 5 centimeter band was a mountainous haystack of potential radio signals, and the hidden Soviet one was but a tiny fragment of a needle. 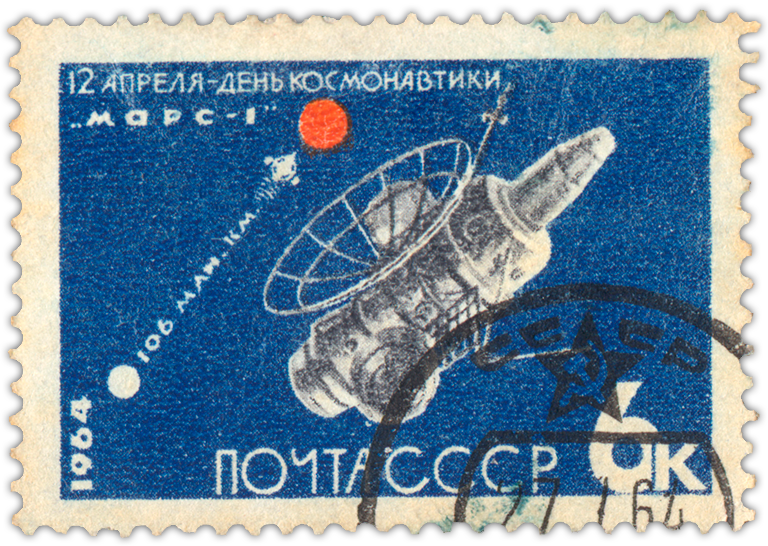 The USSR commemorated the launch of Mars 1 with this postage stamp from 1964. The 21 year period after the Mars 1 launch was a frenetic era for Soviet Space missions. Lunar rovers landed, the first space station launched, and martian and venusian probes sent back images, sound recordings, soil samples, and other scientific data. “CIA hardware specialists visited displays of Soviet satellites at various international space expositions. At Paris in 1968 and at Los Angeles in 1977, the Soviets displayed full scale replicas of satellites used to photograph the Moon and Venus. Experts studied the wave-guides that led from the sensor packages to the radio transmitters,” and found that it was configured for a small range of frequencies between 5.35 centimeters and 4.75 centimeters. The CIA reports also mention that spies were sent for the same task at an exposition in Montreal, the Expo 67 in 1967. Propaganda photographs of Crimean deep space antennas were also scoured for clues. The Americans hoped that the size and shape of the receivers might reveal clues about the signals they were designed to catch. And according to the NSA report, “some Western astronomers ... discretely queried their Soviet colleagues about the Soviet data link.” The astronomers collected dozens of conflicting and misleading numbers, but one unidentified astronomer was told by a Soviet colleague it was around 5.08 centimeters, which ended up being pretty close to the mark. The breakthrough came in the early morning hours on the November 10, 1983. In June of that year, the Soviets launched two new probes to Venus: the Venera 15 and Venera 16 spacecraft. After a four month trip to Earth’s sister planet, both spacecraft were planning to radar map the surface, a task the U.S. was also planning, but for a space mission for in 1988. “If the U.S. Intelligence community was to have a chance to collect the deep space data link, it had to hurry,” reports the NSA document. But by this time, the Americans had a shiny new tool, outlines the NSA report: “a system designed specifically for the collection of signals from deep space.” It was nabbed from NASA's then Search for Extraterrestrial Intelligence, or SETI. Although SETI projects predate NASA’s brief foray into alien hunting, NASA's SETI project had begun in the 1970s as part of the greater search for radio signals from intelligent life across the cosmos. (The search is still ongoing, and to hear Seth Shostak, the SETI Institute's senior astronomer tell it, even after half a century we're just getting started.) By the early '80s, scientists with the NASA project had developed an extremely helpful piece of machinery to aid their search. “Called a Radio Frequency Interference (RFI) van, it was a unique configuration of receivers, spectrum analyzers and computers,” that could scour tens of thousands of individual radio wave frequencies, all at the same time, reports the NSA document. The equipment, which was fitted into a trailer van, is an extremely useful tool to listen in to lots of different radio channels in a short period of time. That's perfect if you're searching the sky for an unknown extraterrestrial signal ... or a hidden Soviet one. When the CIA discovered they could use the SETI van, it was being put to use at a NASA site in Goldstone, California. 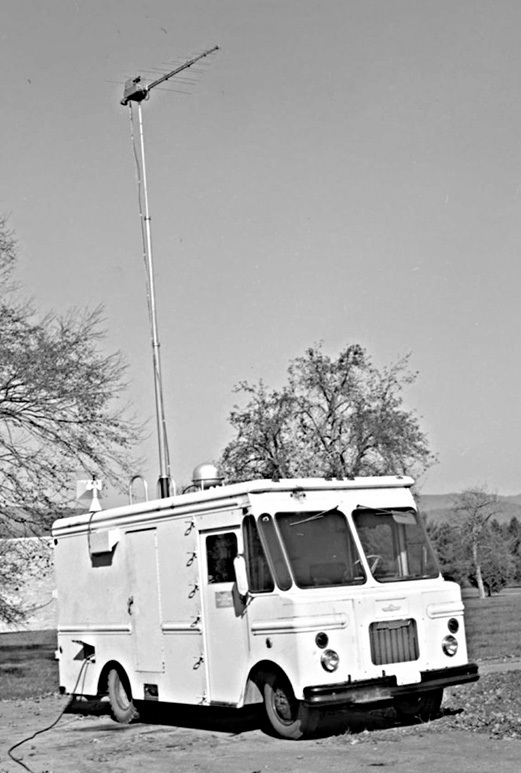 The RFI van was being used for SETI research, as well as to monitor the increasingly weak signals of U.S. deep space probes like the Voyager probes — still today the furthest man-made objects from Earth, bedecked by Carl Sagan with golden audio records of speeches and music, photos, and visual etchings for potential alien discoverers. To move the RFI van, an Air Force C-5A 'Galaxy' transport plane was flown in, and the van was shoved inside. The NSA document remarks that “it barely fit.” The RFI van was then flown off to a secret, still-redacted listening station somewhere along the Crimean meridian. The van was hooked up at the site in early October 1983. By October 14th, both of the Soviet Venera craft had made their long journeys to Venus intact, and the Americans were ready to listen in. For a month, the search bore no fruit. Worse still, public claims from the Soviets that they had obtained their first radar pictures frustrated the CIA signals collection experts to no bound. The CIA had detected nothing with the RFI van. Where was the signal? Why wasn't the RFI van working? Were the Soviet's telling the truth or lying? After that failed month, the Defense Special Missile and Aerospace Center, which was coordinating the spy mission, seriously considered scuttling the attempt. But the search for the secret Soviet signal from the Venera 15 and 16 probes was given one last shot for a week in early November. Finally, “shortly after midnight on November 9, Venus rose above the horizon... and the antennas [at the redacted site] began listening,” writes the author of NSA document. The intelligence agencies waited breathlessly as mission control in the Crimea pinged the vessels to start radar mapping. Then at 6:35am local time, a typewriter at the Defense Special Missile and Aerospace Center clacked a short message. In both the CIA and NSA documents, much of the crescendo and aftermath of the secret Soviet signal search is heavily redacted. But in what little is left, the NSA report offers an blanket admission that the search's conclusion did little more than scratch an itch.